The challenge of capturing the entirety of a space and the many visual elements within it is often how to depict the full scope of a space and still show enough information without getting stuck "in the weeds." In other words, how can a sketcher economize the information so he or she can actually finish a sketch on location while keeping a level of detail that the place being sketched feels real, and specific? 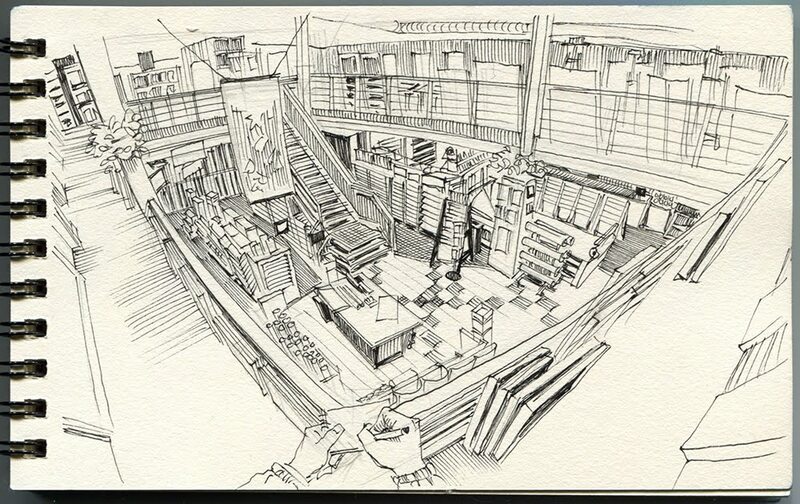 A successful wide-angle sketch can feel both grand and intimate in scale at the same time. 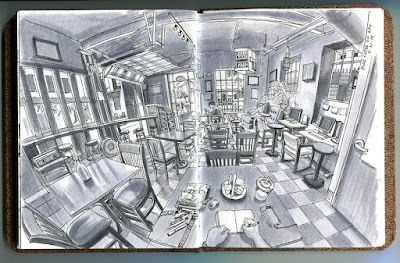 This workshop will help sketchers work through this seemingly daunting challenge. We will cover several approaches to the compositional and perspective challenges that accompany “wide-angle” sketching. How can one render space convincingly with curved perspective and how important is “proper” perspective anyway? How does one catalog enormous amounts of visual information without getting lost? 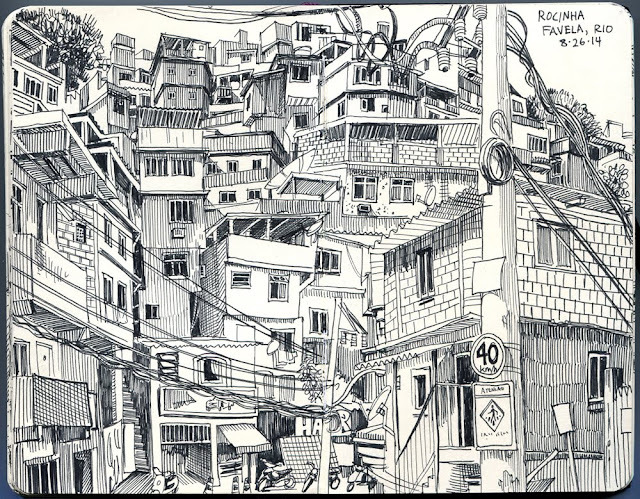 How can one approach the problem of sketching details more quickly and efficiently? Basically, where do you start, and where do you stop??? That it’s okay to be ambitious. Don’t be intimidated by scale or scope; try to find a way to capture it all. Better understanding proportion and location. By accurately describing proportion and relative scale of subjects in your field of view, you’ll be able to make your spatial relationships feel convincing and rational. Learning to economize. In a big, inclusive composition, it’s important to explore how much you can describe visually in fewer lines or marks. Topsy-turvy and curvy perspective aren’t always bad things, and they can often lead to a great sketch. Workshop Location Either an elaborate/expanse interior like John Rylands Library or Manchester Town Hall, or a dense urban area with narrow streets like Chinatown. Lesson 2: Refining and tightening (1 1/2 hours) In this part of the workshop we will work on approaches for establishing and correcting issues of proportion, relative scale and (rough) perspective. The challenge for many sketchers in “wide-angle” compositions is keeping distant subjects appropriately small and close subjects appropriately large. Imagining a grid over your field of view can help to correctly locate and scale information within the picture plane. Lesson 3: Dialing in the details (remainder of workshop) In this last lesson we will try to find a balance between how much detail is enough and how much is too much. We will go over strategies to economize mark-making, so we can cover as much ground as possible without getting hung up on sketching unnecessary visual information. How can you “suggest” textures like tiled roofs and vegetation without drawing every tile or leaf and branch? Throughout each lesson we will also discuss how best to use value to describe volume and suggest space and depth, both through mark-making and in wet media. 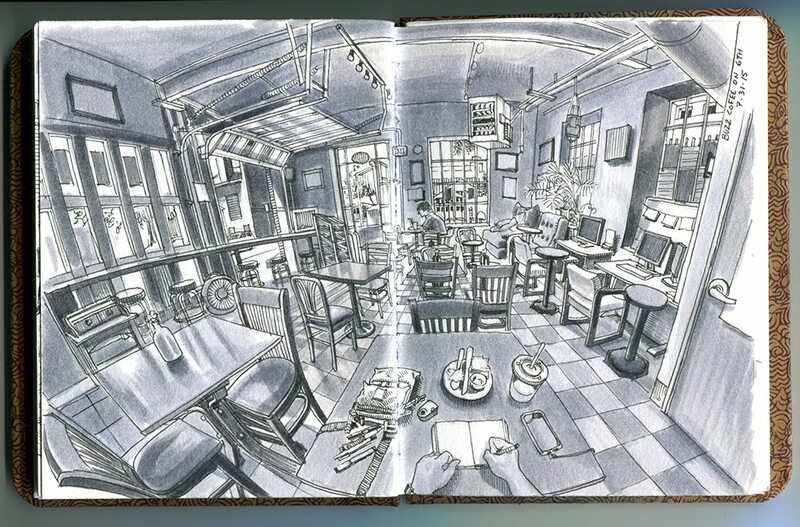 Light, hard pencils (HB-3H), a white vinyl eraser, and a comfortably large sketchbook (not a pocket Moleskine) are important for the first part of the workshop. All media are encouraged as we continue in the workshop. Waterproof ink pens are ideal for working with wet media, such as watercolors or water-soluble colored pencils.